Integrity Staffing Solutions – Are You Building a Bad Reputation at Work? Home>Blog>Are You Building a Bad Reputation at Work? 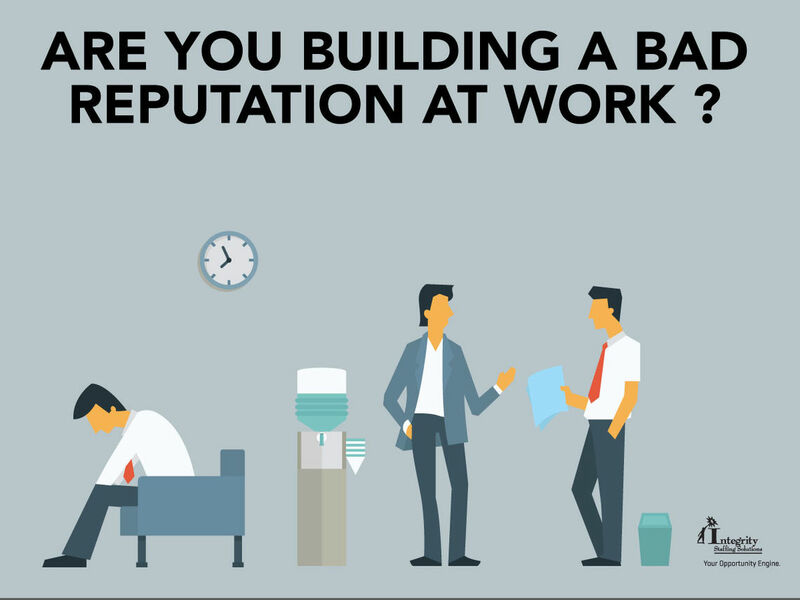 Are You Building a Bad Reputation at Work? You may think you're getting by just fine. Nobody's complained, right? But if you are always passed over for important projects or promotions, maybe it's time to take a look at yourself from your co-workers' point of view. Here are 5 bad habits that people often fall into without even realizing it. 1. Being the last one in the room. You're the one who's consistently a couple minutes late arriving at work in the morning, coming back from break, or getting to the staff meeting. You think: What difference does five minutes make? They think: I need someone I can rely on to be there as promised. You interrupt people while they're working to share a great joke or the latest dirt about Supervisor X and Supply Guy Y. You play your music loud enough to be heard by your neighbors. You put your phone on speaker for every single conversation, dial tone and busy signal. You think: I'm bringing some life into this place. They think: This person is not serious about the job. And is hurting everyone's productivity. This includes taking frequent days off to handle family problems, making personal calls on company time, and using company equipment, such as the printer, to do personal jobs. You think: They should understand that people have lives outside of work. They think: This person is stealing company time, money and resources. You're the one who always waits until the last minute to start a project, even when you knew about it weeks in advance. You think: I got it done, so what's the problem? They think: I hate being forced to worry that we'll miss the deadline. And this project was so rushed, it's full of mistakes. 5. Being the voice of opposition. Of course, not all of management's ideas will be brilliant, and if you see a serious mistake about to be made, you should say so. But that's not the same as criticizing everybody's actions all of the time, whether it's to their face or behind their back. You think: I have a right to give my honest opinion whenever I want. They think: All this negativity is dragging down the whole team. Do you recognize any of these bad habits in yourself? If so, maybe it's time to change your ways ... that is, if building your career is more important than hanging onto your habit. The choice is yours.